Update: Two additional copies of the game will be given away, with myself and my boyfriend Brian selecting the winners for both. It’s like winning a prize for being not good enough for the judges! You never get a second chance to make a good first impression. Considering that the first thing you typically learn about a game is what its name is, I’m always a little surprised when someone totally phones it in. Don’t get me wrong, Xbox Live Indie Game developers aren’t the only ones guilty of this (Attack of the Clones? Was George Lucas sniffing white-out when he came up with that? ), but it makes me wonder if you missed the whole point of being an independent developer. You’re free to name your game anything, as long as it doesn’t contain cussing, racism, sexual slurs, homophobia, drug references, or references to Nazism. Still, that’s hardly limiting, unless you’re one very disturbed person. And yet, in my year of doing this, I’ve encountered names that are just bad. The one that sticks out to me the most (ironically because it does stick out the least) is one called Dark. What an unambitious name. First off, can you think of another game that has the word “Dark” in it? Off the top of my head, I can think of, in order, Baulder’s Gate: Dark Alliance, Dark Cloud, Alone in the Dark, Heart of Darkness, Perfect Dark, Star Wars: Dark Forces, Eternal Darkness, and I think the next Luigi’s Mansion is called Dark Moon. I’m not saying “don’t use the word Dark.” I’m saying jazz it up. Attach stuff to it so it sticks out. I reviewed a game called Inferno! That would have been a tolerable (if utterly forgettable) name if that hadn’t already been the name of a game on the service that was made by a very popular developer as far as XBLIGs go. I played a rhythm-based RPG called Sequence that was overflowing with personality and snappy writing. Of course, Sequence also happens to be the name of a very popular, completely unrelated board game that I’ve played since I was five years old, and doesn’t even really fit the thing anyway. I played a game named Brand, which could very well be the most uninspired title a video game has ever had. Which brings us to why we’re here today. Andreas Heydeck has a game coming out soon to Xbox Live Indie Games. He built it under the working title Simcom Corp. That name is not going to fly. What he wants is help. Specifically, he wants YOUR help. Andreas asked me if Indie Gamer Chick could host the contest. I readily agreed, because this is a contest that makes sense to me. I matched Andreas up with a panel of four guys that cover the XBLIG scene. Those five gentlemen.. well four and Alan.. make it three with Alan & Ryan.. okay, those four buttholes and Andreas, will decide who wins. And what does the winner get? A free copy of the game when it is released. His or her name in the game’s credits. How do you enter? It’s simple: name the game. Submit an entry in the field below, including some means to get in contact with you in the event you win. This contest closes Friday, July 20 at 5:00 PM Pacific Standard Time. Below is the full rules, information on the game, and what the five judges expect from contestants. Good luck. Please note that comments at this site are subject to moderation. I do approvals as often as I can, but it might take several hours for your entry to be viewable. It’s an economic simulator in the shape of a call center/contact center simulator. You build your own contact center building, staff your different functions, and balance your workloads. The goal is to optimize your operation, expand your business with current and new client assignments, keeping your staff happy, equipment functional, and making sure that you are maximizing profits. Leave the name of the title in a reply to this article, along with your Twitter handle, or register to post using a valid e-mail address. Addresses won’t be shared by IndieGamerChick.com except with Mr. Andreas, and only for the winning person. Clearly state the name of the game, and if you feel necessary, why you believe that name fits. Replies must be marked by July 20, 2012 at 5:00PM Pacific Standard Time. If a winner is decided, it will be announced on Sunday, July 22, 2012. I’m looking for a colorful title which clearly defines who this game will best serve. So, what am I looking for in a name? It’s important for the title to be unique (and thus searchable), but it’s just as vital that it match the tone / theme of the game. ‘Call Center Zombies’ has a certain ring (excuse that pun) to it, but thematically accurate? Probably not. Imagine you’re selling this game, and to an extent, you are. Coming up with a name to envelop all sides (searchable, fun, appropriate to the content) won’t be easy, but that’s why you can promise me 400 MSP of the 1600 prize, and I will vote for you. Please note, he’s joking. If he tries anything fishy, I reserve the right to kill and eat him. I will judging partially on Indie Gamer Chick’s Google Rule, and I will be looking for a strategic yet parodic name that could be used. I find that the most catchy titles are usually puns on an established theme or name, thus bringing attention to the game. The Google Rule will apply to my decision once I can find names that rhyme and can be made fun of right off the bat. Example: Minecraft = Minecrap. Creating a name is a tough and thankless task, and I’ve never been any good at it. My cat is called Bo’sun Norbert. I can judge other people’s naming skills, though. A good game title needs to be something that will stick in my mind even if the blurb, screenshots and demo don’t. Something that has relevance to the content of the game. Something that, if I Google it in my capacity as a game critic, will appear before the 500th page of results. In short: I need to be able to find it, remember it and match it to the game. Puns are welcome. LOLcat spellings, hoards of exclamation marks and titles that sound like something an eight year old would find insultingly childish will most certainly get your entry kicked in the face. Please note, it will NOT get you kicked in the face. Any face kicking will be purely symbolic. This competition is open to residents of Europe and United States of America. Entrants from other countries can not collect a full prize. All competition entries will be presented to a judging panel consisting of Andreas Heydeck, Dave Voyles, Ryan Donnelly, Alan Charlesworth and Tim Hurley, who will decide on the winning entry. If two or more people enter the same name, the first person to have entered it will be considered the only valid entry. The decision of the Judges shall be final and cannot be challenged. In their absolute discretion they may declare void any entry or the competition itself should they consider that there are no entries reaching a required standard, whereupon they can award prizes or not as they think fit. The winner will be chosen by the Judges, and the prize awarded to the entry that the Judges consider to be the best. The prizes will be paid at different times. A code for Microsoft Points will be sent via email or direct-message on Twitter to the winner within 2 weeks of winning the competition. A code to the game will be sent to the winner via email upon release of the game. By entering the competition, you agree to having your name and/or nickname published on various websites/blogs. All entries in the competition will be the property of Andreas Heydeck Games, and released only if not voted as the winner by the judging panel. Entries will be deemed invalid if the entry would be covered by any type of patent and/or trademark owned by another company or studio. Andreas Heydeck Games is responsible for all aspects of this competition, and not IndieGamerChick.com or its sponsors. I was fifteen at the time it came out. I loved that game! “Tiny Call Center Tower” or “Tiny Call Center” – it just kind of reminded me of the Tiny Tower game. “Call Center Simulator” or “Call Center Sim” – sometimes the most obvious is the right choice. Just a quick reminder that if your entry does not immediately appear, it’s because all comments at this site from new posters go into moderation. I will approve them as soon as I am able to. 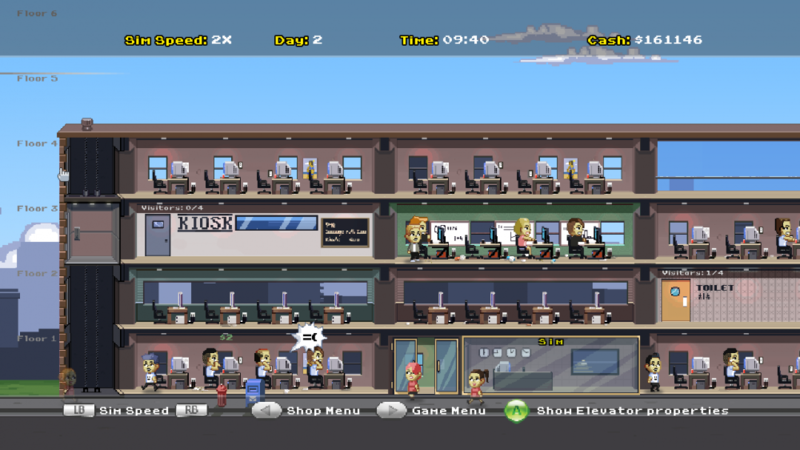 “Corporation Inc.” was it’s original title, I played / beat it the day it was released on Kongregate. PS – Kobold’s Quest Rules. I think it’s catchy, as in: Have you played “Hello!” It’s great. Hope you find a great name. Note from Indie Gamer Chick: This is not a real entry, as Mario is a sponsor of this site and thus ineligible. Just as a warning to Andreas, if you use that name, operatives from Microsoft will kick open your door and shoot your dog. Known as the Bluebones Curse Rule. A spin on Home Shopping Network. Hone as in perfecting the business, Talking as in, well, the nature of the business, and Network as in phones or communication. A spin on Home Shopping Network, hopefully catchy. Hone as in perfecting the business, Talking as in, well, the nature of the business, and Network as in phones or communication. Editor’s Note: This was received after the deadline.